Today’s P90X workout was shoulders and arms. I was in a lot of pain before doing the workout, and even now the flexors in my elbows are killing. If one thing is true though, it’s that working out sore muscles does nothing but make them feel better. After looking at my food intake yesterday, I realized that I need to be eating more. This may seem strange, but it’s true. If my muscles don’t have the energy to work out, then this whole thing will be an uphill battle. On that note, this is what I ate today. Two big bowls of Chex. A tuna sandwich (shoulda swithed out some of those PB&Js for more of these). 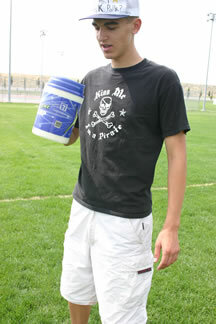 A protein shake with 80g of protein. My wife made brownies for some people in our ward (church congregation) who just had a baby. I wanted to eat one, but decided that if I was going to I needed to weigh less than 200lbs. I will not say what my weight was, but I did not get to have a brownie. I attribute this to my calorie intake and the fact that I’ve been drinking a lot of water. I’m fine with it. I know that my daily, or even hourly weight does not change the fact that I’ve been eating better and working out. I decided I should post some before-I-got-fat pictures. This is from my senior year. These show off just how thin I was, but also just how scrawny I was. Despite being so thin I did not have a six pack. The over-the-hill moment for my fitness should not have been in high school. I gotta get in the best shape of my life now. This entry was posted on Thursday, March 4th, 2010 at 1:35 am and is filed under Uncategorized. You can follow any responses to this entry through the RSS 2.0 feed. You can leave a response, or trackback from your own site.